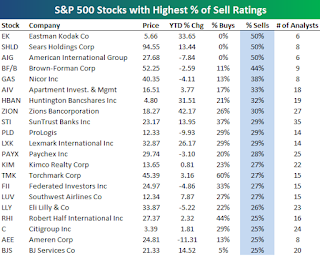 According to this report from Bespoke Investment Group, Sears Holdings (SHLD) tops the list with Eastman Kodak (EK) and AIG as the most disliked stocks by the analyst community. Pretty impressive company to be in the same group as AIG. The contrarian in me suggests that this makes SHLD an excellent investment at these levels. SHLD reported nearly $4 in earnings per share in 2009. Considering how horrible the retail environment was last year, its likely that SHLD will report even better numbers in 2010. Even lowly chain KMart has now turned around its fortunes and actually posted positive comps in Q4. Trading at nearly $100 the PE might seem high at nearly 25 on a trailing basis, but as has been documented numerous times on my website and via other reports SHLD has several assets that aren't properly reflected on its balance sheet such as its real estate. Its worth a lot more just earnings alone. After a year when Natural Gas inventories hit record levels, it might surprise people to see that the weekly report is now showing inventory levels only 0.7% above the 5 year average. In fact, the important East market is 2.4% below that average. With weak industrial demand, its likely surprising to most that storage levels are now inline with normal trends. Alot of the burn down has been due to the gruesome weather especially the record snows in the East. Regardless, though the more normal inventory levels set us up for higher prices as demand returns. After losing 8.4M jobs during this recession, a jobs bill that is estimated to only add 250,000 jobs seems rather worthless to pursue. After all, we're talking about a lot of rules and regulations that must be adhered to in order to qualify not to mention the accounting work that it takes to work out that numbers and track which employees do and don't qualify for these tax breaks. Mark Zandi is a very credible economists so we'll go with his numbers. They pretty much sum up the bill. Too little and too much work to track. It seems intuitive and the markets always seem to react as if rising rates are negative for equities and declining rates are positive for equities. As usual with the stock market, simple thinking can burn you very fast. The market is much more complex then just "Don't Fight the Fed". Go back to 2008 and question that thesis. 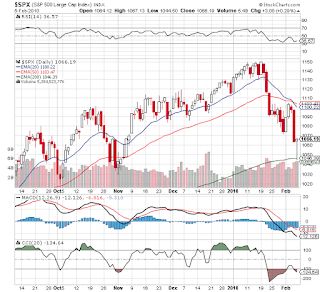 Rates were declining and stocks were getting crushed. Why? Well its because even though the interest rate direction has an impact on the economy it takes a long time of up to 12 months for the impact to be felt. When the Fed is lowering rates from an already low level it signals distress which leads to panic in the markets. Did the Fed lower the fed funds rate from 2% to 1% because it wanted to juice the recovery or because they feared the Great Depression II? Fast Money is always an interesting show because it features 4 traders and its always good to know why traders are doing what there doing. When this show is as bearish as it was today during lunch, it makes Stone Fox Capital much more bullish. Especially when we are already bullish. So why were they so bearish today? Surely it was due to higher interest rates or negative earnings reports or a meaningful economic report. Nope. It was because of the weak Consumer Confidence report today. A report that is generally dismissed because of its lack of forecasting actual consumer spending trends. Interesting to see Chesapeake Energy (CHK) drilling for more oil. The CEO has a great point that if they have a huge find in natural gas it will cause spot prices to decline, but if they hit it big in oil the spot prices won't be impacted. More signs of how their success in drilling has impacted the prices they sell the product since they haven't been able to provide for more outlets to absorb the additional production. Great point on coal, but it doesn't appear to be in the works. We're still a bigger bull on coal since its more of a global demand story then the domestic natural gas. Liz Claiborne (LIZ) has been a favorite of Stone Fox Capital for a while now. Not sure we'd agree with the best upside pick, but possibly in the retail space. LIZ has a huge opportunity to rebound and the current retail climate is becoming more favorable. The WMT news shows signs of consumers starting to move back up the retail ladder. The 2011 EPS target of $.68 is very compelling with the stock in the $6s. Our target continues to be in the $12-15 range. A stronger retail environment will all of a sudden make that transformation much more successful. Interesting news from India on the coal front. Further signs of the value in having commodity assets with the growth of India and China. The Telegraphhighlights the growing demand for imported coal as an issue with coal production in India. At least this time its production, but we all know that demand will surely grow. These reports how India is likely to remain behind the curve. Maybe they should make domestic coal prices more expensive and hence the local production might just magically increase. Hartford Financial Services (HIG) continues to report solid core earnings. The market seems to doubt the staying power of these earnings. Check out the book value for this $22 stock reported after the close with the Q4 earnings. Currently $38.92 or $47.56 if you exclude the AOCI. With core earnings approaching $4 in 2010 its perplexing to understand the multiple on this stock either based on earnings or book value. It won't last forever! Local.com (LOCM) reported another strong quarter last week and again guided to strong growth in 2010. All in all they reported 47% revenue growth in 2009 amazing considering the economic environment and the history of LOCM failures. For Q4, they reported 8% sequential growth and generated $2.8M in cash. All of the reported numbers and guidance handily beat estimates (not that many exist). LOCM has clearly turned the corner to a fast growth, profitable company. Stock is still lagging for a lack of attention as they only had 2 analysts with estimates at that time. After the SP500 touched just below the 200EMA at 1046, Stone Fox Capital used the roughly 7% cash we had accoummulated from selling US Steel (X) a few weeks back to become fully invested. The portfolio has only $4500 left in cash so we'll likely look to trim a few positions on a solid bounce in the market next week. 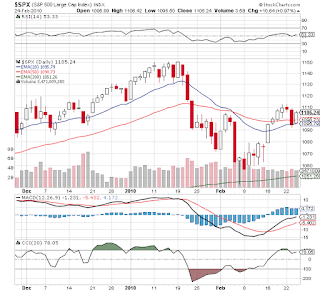 A huge oversold market (at one point down 4.7% in less then 2 days) creates a great entry point for adding to positions. Now this news from CNBC and the fact Synovus Financial (SNV) is down 10% tops the list of absurdity. No way SNV would issue any share to repay TARP. They aren't in any pressure and in fact shareholders don't want them to repay TARP at this time. Maybe if the shares jumped to $5-6 they could consider an offering to repay TARP. Otherwise, thats just an issue for the major banks like PNC that did an offering this morning. Buy the dips from the dips! Analysts said regional bank shares were hurt by the prospect of TARP repayments, including dilutive common stock offerings like PNC's announcement, and investor worries about first-quarter 2010 performance. Edit 3:10: Interesting note from FBR on buying the regionals on this dip. Today the ISM Services index was reported at 50.5 which showed growth but it was disappointing with expectations at 51. 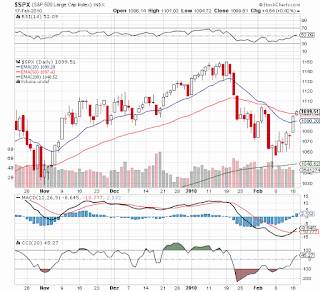 Not exactly a meaningful miss, but one non the less which I think enforced some fears that the economy is stalling. Ok, it went from contracting to growing in January so that doesn't really jive. Good analysis of the ISM report from First Trust. They feel strongly that the Business Activity indicator at 52.2 is a better indicator of the sector then the sentiment induced headline number of 50.5. Bespoke has a nice chart today averaging the 2 ISM indexes. Since Manufacturing as been very strong, it shows how the combined numbers tell a different story then what the market seems to think. A picture is always worth 1,000 words when it comes to economic data. Even during the Great Recession, Riverbed Technology (RVBD) as able to post strong double digit revenue growth in 2009. For Q4 they posted 23% revenue growth and reported $.21 vs a $.18 estimate. Very solid numbers though it's not likely to push the stock price higher as the market seems to favor stocks that got rocked in 2008 and now have bounced back a little. Though it seems to not be noticed that RVBD peaked out over $50 so it has hardly rebounded even though they are reporting record numbers. The really impressive number was the generation of $96M in cash during 2009. Cash now totals $326M or nearly 20% of the stock valuation. On a EV basis, RVBD now trades at roughly 13x cash flow (EV of $1.3B/96M cash flow). Its been stuck in the low $20s for a while so the valuation is becoming more and more compelling. Maybe 10x a $125M estimate for 2010. Cheap, cheap, cheap!